Here's another past post that seems to have generated a lot of interest. This one was first published in January last year. Right before the Christmas holidays I introduced note taking to our Grade 3 - 5 students on one of our campuses. This was to support the units of inquiry they are currently working on: in Grade 3 they are looking at culture, in Grade 4 they have been looking at belief systems and in Grade 5 they are looking at legacies from ancient civilizations. All the students needed to have the skills of being able to read a book or a website for information, and to be able to watch a video or listen to a speaker to gather more information. We talked about the fact that different skills are needed when reading or when viewing where the information is coming at them in a faster pace and that often in movies students will be expected to take in visual stimuli as well as just to listen. I think it's important for students to understand why we ask them to take notes when they are searching for information. Therefore we talked about how much information is actually retained a day or a week after first reading or viewing something. As Dale's Cone of Learning shows, very little is retained with simply reading. If we look at how much is retained with watching a video (seeing and hearing) more is retained but still 50% is lost after just 2 weeks, as all of these are passive, so the students and I were talking about why we take notes and how this gives us a written record with details that we can refer back to later. Our librarian had already introduced some of the students to note taking using books and websites. She had pointed out that books have headings and sub headings and are written in a very linear way - therefore to take notes from books and websites it's important to do this in a linear way too with headings, subheadings and bullet points. Our librarian had drawn up some templates for note taking and I introduced these to the students to see if we could also use these for taking notes on a movie. In all 3 classes students watched a short movie connected with their unit of inquiry and practiced taking notes using these sheets. The handout was arranged with 2 columns - one for writing quickly during the movie and one for summarising afterwards. I explained to the students that it would not be possible for them to write in full sentences that they should just try to write down a few words about the things that seemed most important. At the end, after a discussion of the main points and identifying some key words that were common in all the students' notes, I asked the students to summarise or synthesise on the other side of the page the notes they had quickly written down, using the key/common words we'd identified as headings. With our Grade 3 students, the following week I asked them to get out their notes and again, using the keywords as heading, I introduced SpicyNodes to them, showing how they would turn the headings into the nodes and the notes they had made under the headings into sub-nodes or descriptions of the nodes. Our Grade 3 students are shortly going to "meet" the poet Kenn Nesbitt using skype. This is a different kind of oral presentation but one where students need to be well prepared for what they are going to be hearing - as our librarian said: there is no rewind button for a speaker and being part of the audience is also an important role they need to play too - they need to be looking at and interacting with the speaker, not just looking down and scribbling notes . For this session I have also reproduced some of the handouts from Silvia Tolisano's post about how, during a skype call, students can have different responsibilities - so that not everyone in the class needs to be note taking at the same time. I am sharing these handouts with our Grade 3 teachers so that they and the students are well prepared for the skype call with Kenn next week. As mentioned in previous posts, in the past few months I've been looking at our units of inquiry, and how technology is used to support these units, in the light of the 6 new strands identified by the PYP. So far the note taking has been part of the investigate and organise strands, or in the more traditional language of the inquiry cycle, it has been part of the finding out and sorting out stages of inquiry. 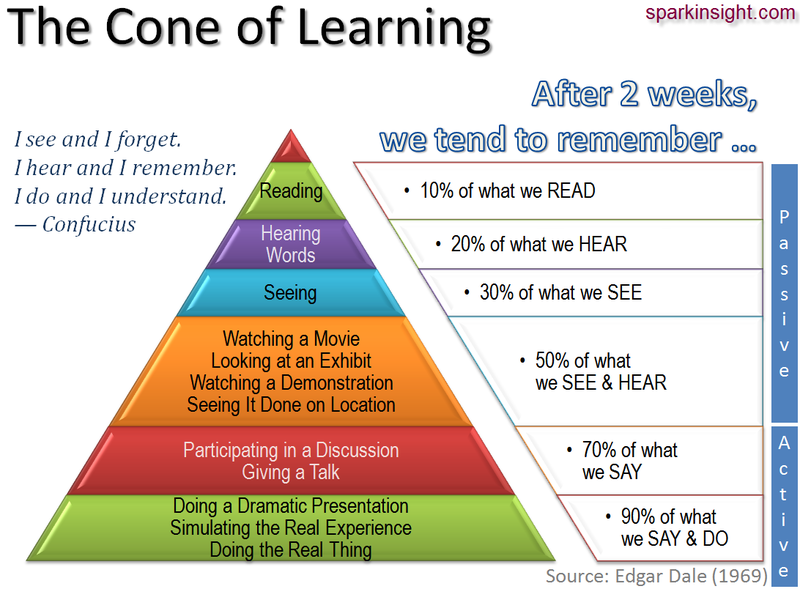 After this it will be time to move on to the more active parts of the Cone of Learning. Students will use the results of their investigations to create something that communicates their knowledge and understanding. Our Grade 3s will be using SpicyNodes or Prezi, our Grade 4s are using VoiceThread and our Grade 5s are talking about using interactive timelines. The notes they have taken will reappear in what they are saying and doing - and finally we will be able to assess their (new) knowledge and understanding based on these units of inquiry. Thanks to Silvia Tolisano and to Elizabeth, our Librarian, for the ideas and resources that have helped me support our students in their inquiries.